Jeanne developed an appreciation for nature as a child. She is the youngest of five children who were able to explore the outdoors during family hikes and camping trips. Jeanne graduated from University of Cincinnati with a degree in Chemical Engineering. She worked for the Department of Energy at Mound Labs until she decided to stay home to raise her children. Her daughter Amy and son Ray were both married within the last year! The love of nature fostered when she was a child has not left her. She and husband Dave, her high school sweetheart, often take vacations centered around bike trails and nature parks! Other interests include foreign travel, games and puzzles, reading and family gatherings. Jeanne also took organ lessons and now works as the organist at Centerville United Methodist Church. We are celebrating Jeanne’s 5th anniversary with CWPD! 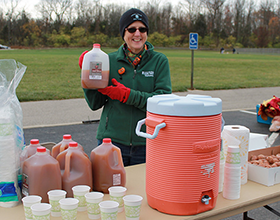 She started volunteering in the park office in 2012, and now enjoys assisting in a variety of programs.